BERLIN –– Brianne Annino had always wanted to go up in a hot air balloon. Her boyfriend, Manchester firefighter Matthew Ziegler, has been planning to pop the question to the 27-year-old Annino since May. Thanks to Ziegler’s coworker, Manchester firefighter Jim Reagan who is also a balloon pilot out of Berlin, Colchester residents Annino and Ziegler had the hot air balloon ride of their lives Friday morning when they became engaged high over Shuttle Meadow Golf Course in New Britain as they were floating in the wind. “She made a comment, like two years ago, that she wanted to take a hot air balloon ride,” the 26-year-old Ziegler said. 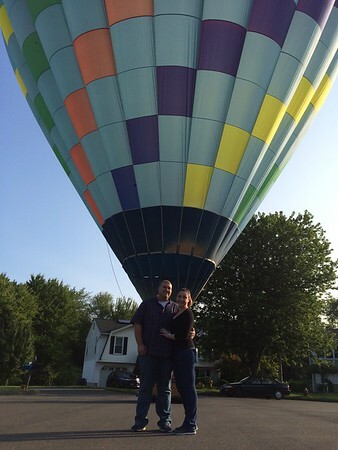 In May he started looking for hot air balloon pilots who could make his girlfriend’s dream come true and provide a stunning backdrop for Ziegler to ask Annino to marry him. He found CT Ballooning, LLC, out of Kensington, on Facebook and messaged the owner, Ziegler said. He was surprised when he found out it was Reagan, a fellow firefighter who he had worked with for two years. Reagan has been piloting hot air balloons for more than 30 years. Reagan was one of the dozens of pilots who took off from the Plainville Balloon Festival early Friday morning in a display of color in the sky. He’s lived in Berlin since 1991 and will often take his blue multi-colored balloon over his neighborhood to land when the wind cooperates. Annino, a night shift nurse, admitted she was a little curious as to why Ziegler wanted her out the door to go to a parking lot on the other side of the state early Friday morning. “I was like what are we doing?” she said with a laugh. When they arrived, she learned they were taking a hot air balloon ride. As the balloon moved across the landscape toward Berlin, Reagan pointed out landmarks to the couple. At some point, he gave Ziegler a signal that the ride had about 10 minutes or so before they’d land, so the would-be groom pulled out the ring as they floated over Shuttle Meadow Golf Course. “I turned around and he was on one knee,” Annino said. By about 7:45 a.m. they drifted past Percival Park in Berlin which didn’t work for a landing, so Reagan flew over his street and headed above a few houses on Winding Meadow Drive before gracefully touching down in the middle of Kelly Ann Court to the amazement of neighbors and a caravan of workmen who started following the balloon as it sailed past. When Reagan called out that the couple had just gotten engaged, there were cheers all around. After Annino hopped out of the basket, she tearfully called her mother to tell her what happened. “Are you crying again?” Reagan playfully said as he began packing up the colorful globe. “It was gorgeous,” Annino said. Posted in New Britain Herald, General News on Friday, 24 August 2018 21:44. Updated: Friday, 24 August 2018 23:13.